I am in love...in France! 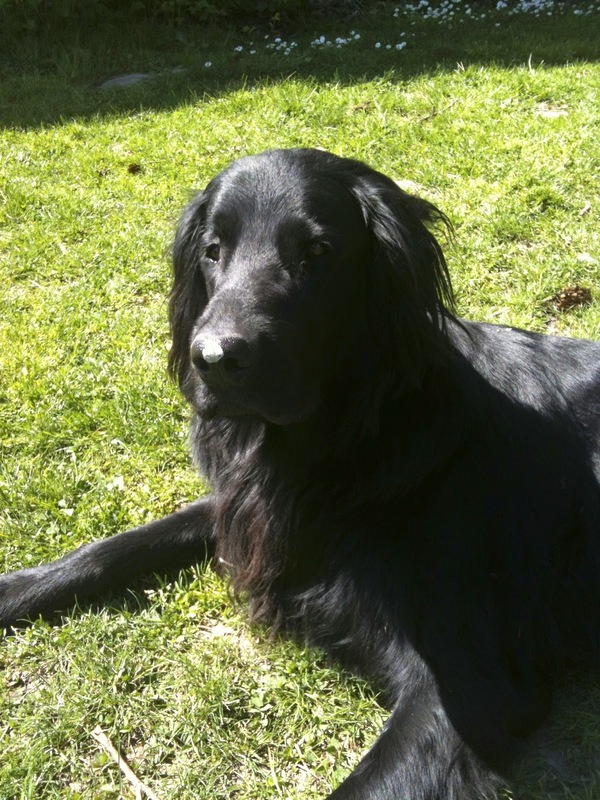 His name is Ben (le chien), and isn't he beautiful? He's only 3. This past weekend we went to the market (the Saturday marché)...we found beautiful plump purple tomatoes, artichoke hearts (reminds me of the giant ones I shared with my cousin Stephanie near Notting Hill in London), rosy orange carrots, a box of fresh peaches, and of course, plenty of fromages (cheeses). Normally Ben walks sans leash, but in a market setting there are far too many temptations - including cheese, bread (like any true Francophone, Ben loves bread & cheese - his eyes grow large at the slightest whiff), other puppies, interesting people (possible contenders for a good sniff or a jolly and generous lick? ), and other exciting goodies. Sometimes Ben cannot contain his excitement and lifts Jen straight off the ground, sending us both flying through the air as he lunges towards fellow four-pawed friends au marché! With his shiny dark fur he gets hot v. quickly, so we made sure to give him regular sips from a water bottle today. 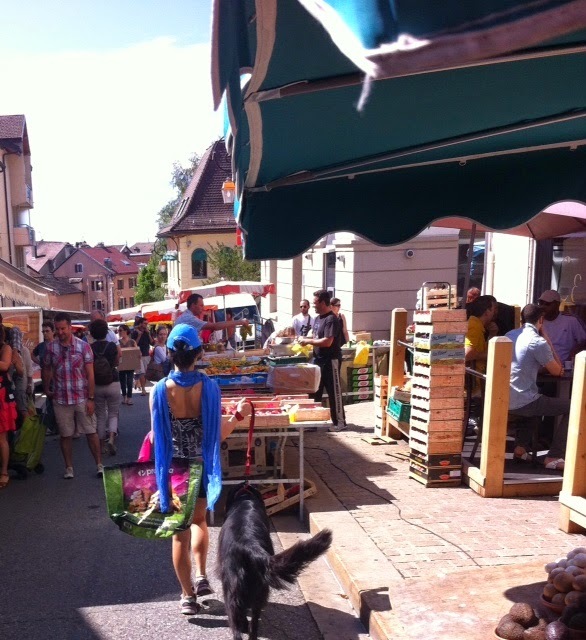 "A Dog Abroad: Monsieur Baron Ben-le-Chien in France Diaries"...(tbc). Happy Summer to my CCI Sisters! "THE HARDEST BATTLE IS TO BE NOBODY BUT YOURSELF IN A WORLD, WHICH IS DOING ITS BEST, NIGHT AND DAY, TO MAKE YOU EVERYBODY ELSE." Greetings from France! Hope you're enjoying some time off this summer. I'm in the process of making some healthy changes, and will share more in a bit (still getting settled in Europe). A New Partnership with Connect-a-kid! Charlotte and Laney, here, reporting from Central Park in New York, New York, where we have just attended a picnic, sponsored by the New York branch of the non-profit Connect-A-Kid, for adoptee mentors and mentees! It was such a great day to hang out together, play ball, and eat Italian subs in the shade. China’s Children International first got in contact with Connect-a-kid about a year ago, and we were intrigued. Here at CCI, we truly believe in what CAK is trying to do - building a strong and healthy adoptee community for years to come through fun, safe, and engaging programs for the younger adoptees of our generation. But we wanted to see how the programs run in person, and try to get a feel for what the program is all about, so that’s why we travelled all the way to New York City to attend an event as special visitors. The specific event we attended was run by the New York branch at the famous Central Park and brought together local adult adoptees with a group of youth adoptees to play, hang out, and bond with one another, through playful activities and a nearby puppet show run by a park entertainer. The event itself was not centered around adoption related discussion but rather it was a fun playdate for young adoptees to interact with adult adoptees. However, both the parents and the mentors understand and appreciate all of the benefit that can eventually emerge from a program like Connect-a-kid. Speaking from an adult adoptee perspective, we both wish a program such as this had been available when we were children. After having attended this amazing event, seeing first hand the impact and sheer joy the adult and youth adoptees gain, we are even more excited to officially announce CCI’s partnership with Connect-A-Kid. That’s right - we plan to work on developing a CCI / CAK mentorship program specifically for the Chinese Adoptee community based on Connect-A-Kid’s model! Stay tuned for CCI’s Connect-A-Kid pilot program to launching in a select city in California this fall. More information to come! Final shout out and a great big thank you goes to Brian Conyer, Meg Vandervort, Chris, and Paul from Connect-A-Kid. We are so grateful for the chance to learn and model ourselves after such a wonderful organization! Just wanted to pass this info along to you all! More details are below. Rick Shiomi has written a stage play adapted from the book Message from an Unknown Chinese Mother by Xinran, which will be performed in St. Paul Minnesota. After working extensively with the Korean Adoptee community, Shiomi is excited to take on this adaptation of Xinran’s novel. Shiomi is the recipient of the Sally Ordway Irvine award for Vision, The award for Leadership from State Council of Asian Pacific Minnesotans and the Ivey Award for Lifetime Achievement in the local Minnesota theater community. He will be presenting a workshop performance of this new play on May 30th and 31st at 7:30 pm and June 1st at 2 pm at Dreamland Arts, 677 Hamline Ave. N., St. Paul, MN. 55104. This event is FREE though seating is limited. To make a reservation to attend, go to the website for dreamlandarts.com and go to ticketing. Suggested for adoptive parents and older adoptees due to the graphic nature of some of the stories. We need your help to make this project a success!! Check out our videos to find out what we're talking about! It only takes a few minutes to record yourself and email us your video clip! We can't wait to share the final video, but we can't do this without your help -- so spread the word and get excited!!! 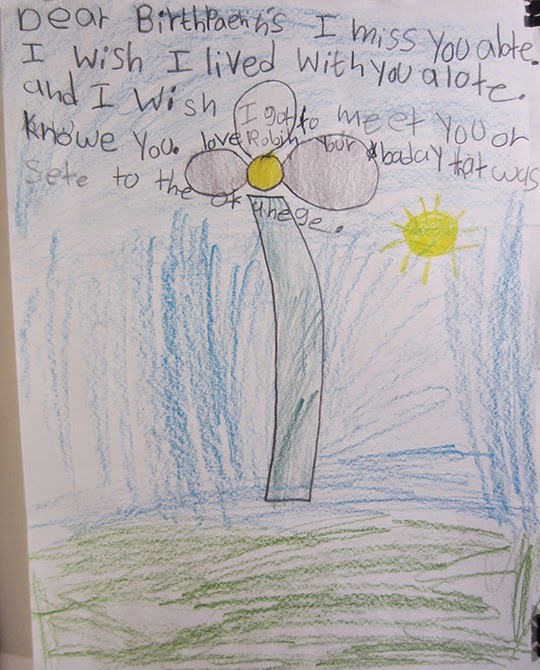 We've just been contacted about by Chinese adoptee and RISD Junior Robin about an awesome project that she is leading! It all began when I found some old drawings I had made as a kid (maybe six or seven years old). They were letters that I had written to my birthparents when I was first beginning to understand where I came from. They were never sent as neither I nor my mom know my birthparents nor had any way of contacting/finding them. We went back to China between my senior year of high school and my first year at RISD. While there, we were able to visit my orphanage, which has since changed quite a lot. We saw my file, which like we had expected, offered no new information as to who these unknown people were/are. Since then I continue thinking about what I'd want to say to them if I ever did have the chance to meet them. Letters for Them came as an idea that perhaps other adoptees think about this as well. Wouldn't it be cool if we all had a common place to send thesetechnically unsendable letters? Thus, Letter for Them was born. Letters for Them is an open invitation to any and all adoptees. No matter how old you are or where you were adopted, whether you know your birthparents or not, if you are an adoptee, you are invited to participate. This is meant to be a public, open space for adoptees to write to their birthfathers and/or birthmothers. The letters can be as creative as you wish; they may be simply typed or handwritten notes or they may be collages, drawings, etc. Another way to think about this: given the chance to say anything to your birthparents, what would you really want to say? What would you want them to know about?" On May 1st the letters collected thus far will be made into a book for her family album class at RISD. Learn more about her open invitation on her website Lettersforthem.com. Calling All CCI Members- Be a Part Our New Promo Video! 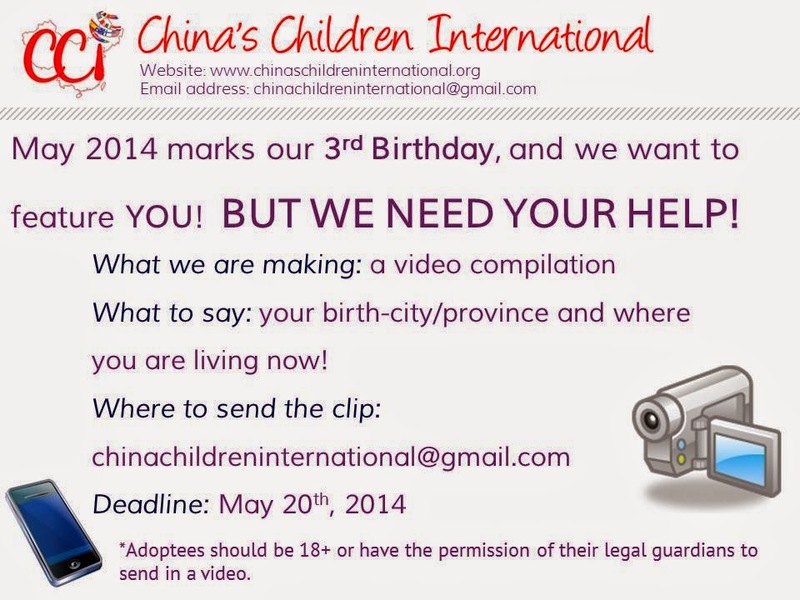 In honor of CCI's 3rd birthday this May, we are making a new promo video featuring our members. One of the amazing things about CCI is the fact that our members are not only from all around China but also they now live all around the world. If you are interested in being apart of this promo video, please submit a video recording of yourself in a place that includes scenery from where you are currently living. All forms of video recordings are accepted. in the video you will say: " I was born in: city & province, I now live in: city & state or city & province"
As many of you know, I'm very excited to announce that I am in the early stages of pre-production for my first adoption documentary film (based in part on my Ph.D. research, as well as my personal adoption journey). I'd love your feedback as the film develops. Meanwhile, since many publishers have been approaching me to review books over the past few years, I'm delighted to introduce a new blog for book reviews called My Inspiration Garden. If you've written a book, or would like a review your book posted, you can write to me directly at jenniferjuesteuck@post.harvard.edu, and I'd be delighted to read and write about your work. Hello! My name is Candice Presseau, and I am graduate student in the College of Education at Lehigh University. I am currently completing my doctoral dissertation research study under the supervision of my dissertation co-chairs, Dr. Cirleen DeBlaere and Dr. Arpana Inman, and am interested in studying the life experiences and well-being of racial minority individuals who have been transracially adopted by White parents or a White single parent. It is our hope that with this study, we can contribute to the understanding of the experiences of adopted persons raised by parents with different racial backgrounds and experiences from their own perspectives. Your participation is essential to achieving this goal, so we hope that you will take part in our study. In order to participate, you must identify as a member of racial minority group, have been transracially adopted by White parents or single White parent, currently live in North America, and be 18 years of age or older. If you would like to participate in our study, please click on the link below and you will be directed to the online survey:https://www.surveymonkey.com/s/transracialadoptionsurvey. Thank you very much in advance for your time! Please feel free to pass on this link to other people who might be eligible. If you have any question about this study, please feel free to contact me at cdp309@lehigh.edu. This research has been approved by the Lehigh University Institutional Review Board (IRB# 397756-2). Just wanted to let you know that there's a need for bibs and hats at LWB - in case your members are interested! CCI received an email from Sophia Gonfiotti-Mattingly. She is doing a study that will "help give a voice to our unique population and help inform the understanding of their needs. This study includes a short 20-30 minute survey. "The results of this study will be used to further the goals of the participant community as they are truly the only ones who know where the work needs to be done. It may be used to help develop parent educational programs for adoption agencies, independent workshops, seminars and text for adoptive parents and their children and to educate and inform the population at large, etc... "
CCI just wanted to spread the word to the adoptee community!